We’d love your help. Let us know what’s wrong with this preview of Myths and Mysteries of New Hampshire by Matthew P. Mayo. 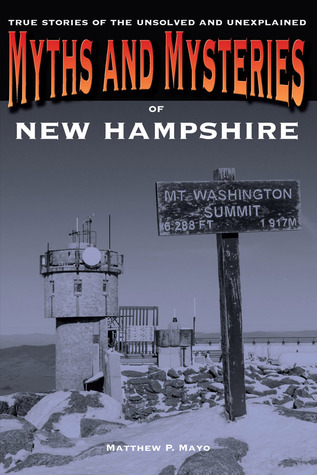 To ask other readers questions about Myths and Mysteries of New Hampshire, please sign up. Lots of fun and interesting stories of New Hampshire's past and present. A very enjoyable read. Matthew P. Mayo is the award-winning author of thirty-plus books and dozens more short stories. His novel, Stranded: A Story of Frontier Survival, won the prestigious Western Heritage Wrangler Award for Outstanding Western Novel by the National Cowboy & Western Heritage Museum, as well as the Spur Award for Best Western Juvenile Fiction by the Western Writers of America, the Peacemaker Award f Matthew P. Mayo is the award-winning author of thirty-plus books and dozens more short stories. His novel, Stranded: A Story of Frontier Survival, won the prestigious Western Heritage Wrangler Award for Outstanding Western Novel by the National Cowboy & Western Heritage Museum, as well as the Spur Award for Best Western Juvenile Fiction by the Western Writers of America, the Peacemaker Award for Best YA Novel by Western Fictioneers, and the Willa Literary Award for Best Historical Fiction by Women Writing the West. His novel, Tucker’s Reckoning, won the Spur Award for Best Western Novel, and his short stories have been Spur Award and Peacemaker Award finalists.